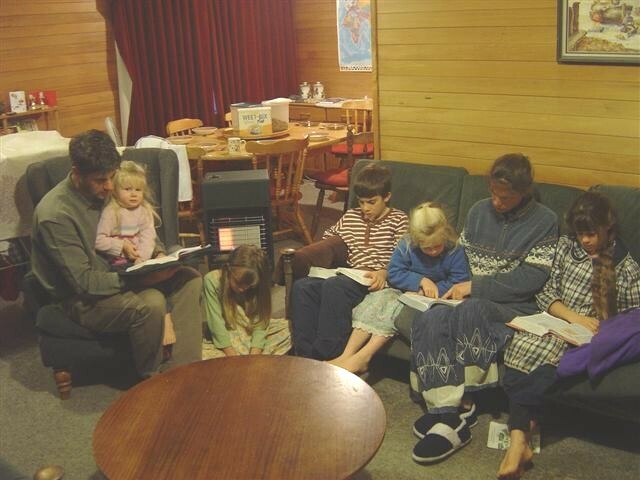 Our picture shows one of our families having a reading from the Bible while breakfast waits for them on the table. Taking family devotions is father’s responsibility. If father is not there, then mother, you need to do it. It’s a task that most father’s find very difficult and would rather avoid, so help is needed — from the Holy Spirit and from others in the Church. Dads, you must pray, so that the devotion time is interesting and life giving for your whole family. Dad, make sure everyone is up on time. No sleeping in unless there is a good excuse. 7am is a sensible time for everyone to be up, then set aside half an hour to seek the Lord together. If someone is really sick and can’t get out of bed, then have the devotions in their bedroom and at the same time pray for them to get well. What you lead should have variety and be relevant to what the family is going through at the time. For example, if one member of the family is having trouble with lying, then the topic should be on telling the truth. Time should be spent by father before the devotion looking up suitable passages of Scripture, and also getting relevant material from others. It must not be complicated — brief and simple material is best retained by children, with illustrations, and repetition — a scripture, a picture, a song, and some short teaching applying it to the situation that your family is facing together. Then pray together asking the Holy Spirit to help. There will be times when no topic seems to present itself, in which case have the family choose a book of the Bible and read a chapter of it each day. If the chapter is very long then half one day and half the next. Read a paragraph each round in a circle. When the children are very young they will only be able to read one word. For example they can look for the word “God” and when you get to it stop and let the child read that word. Then select another word, like “the”, and so on. In this way you can teach your children to read while having devotions. When a book has been read then mark it off in the front of father’s Bible and then go through the whole Bible if possible before reading that book again. Don’t keep this as a fast rule as the Holy Spirit may lead to read a book a second time in the same year because of its content being relevant at the time. Singing takes courage to lead if you are not musical. Mother may be a good singer — if not then there are ways to still have singing as a family. Having a song in the morning is very important. Get another family in your church who is musical to make a tape or CD of some songs that you want to learn and play it in your devotion time — singing along with it. When you know that there is someone having a difficult time and needs some encouragement or has a birthday, then you can ring them up in your devotion time and sing to them, and give them a Scripture. Preparing to do this makes devotion time exciting, and meaningful. Just remember that when you ring someone outside New Zealand you will need to check on the time difference first or you may get them up in the middle of their night. Meaningful devotion times when a child is young will help make a good foundation for the rest of their life. So it is well worth putting in some thought and prayer in preparing.